How loud can you play? is often a question we are asked. The simple answer is as loud as you like within reason. For wedding ceremonies and drink receptions we tend to be acoustic and can easily lead hymns for up to 120 people if required. For larger weddings the duo is still fine for a ceremony but we have the option to add additional players for the drinks reception, either a cello or violin / flute. 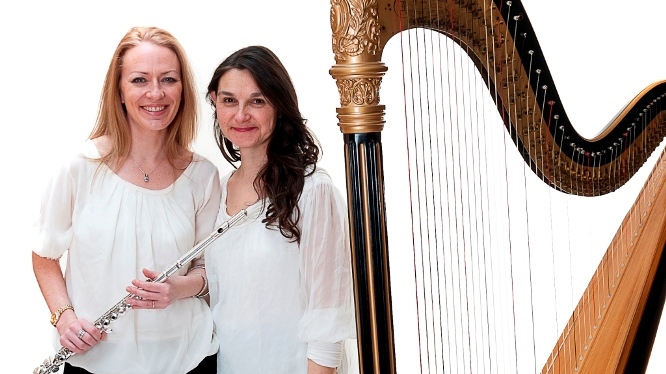 For smaller more intimate weddings we can play a little more softly or use Clarsach instead of harp as it is a slightly smaller and quieter harp. For larger corporate events we would need to be amplified. We do not carry our own amplifier so we rely on the talents of sound engineers at larger venues. A good sound engineer will ensure a quality and balance to the sound we make is carried evenly to all areas across a larger venue. We played recently for a large wedding at Houston House, providing music for the ceremony and then background for the drinks reception. Playing without amplification worked well providing enough volume during the ceremony for the entrance of the bride, signing of the marriage schedule and the recessional of the wedding party. During background drinks we played a range of requests for the bridal party and their guests. Weddings are a special day and it is always pleasing to play something special for individuals in the room. The father of the bride did ask how loud can you play and will you be heard. He was pleased to say he could hear our playing around the function suite at the drinks reception.